I wish I could give away the same CD to all of you....but I can't! So the winner is The Minnesota Mamaleh! Sam is, in so many ways, a quintessential middle child. On the other hand, he and Yael often act like twins, since they have no memory of life without the other one. Either which way, sometimes Sam's personality comes out in...um...unique ways. This Shabbat, Sam spent "one sleep" with his Bubbie and Zeyde. They have made a concerted effort to take each of my three children separately for an overnight and some special event. This year, each child is going to a different play. Sam's play came up first in the calendar, he is going to see Peter Pan (which is very fitting, since we read the original book together this summer). Sending Sam to his grandparents' house took a week of "sales" pitches. Sales pitches that, for the first time, actually seemed to work! This morning, he bounded into my room and asked "is today the day I go to Bubbie and Zeyde's?" When I responded yes (and I must admit, cringed, waiting for his response), he cheered and asked if he could take his feetie pajamas. I said yes, and we planned the packing in a few brief sentences. He left my room, empty suitcase in tow. I turned to my husband and we high-fived. A few moments later he was back again. "I don't want to go to Bubbie and Zeyde's! David and Yael will get ALL THE TURNS here while I'm gone." My husband did a great job of explaining that while he was at their house, HE would get all the turns there. "Yes, but not HERE," Sam responded. Eventually, it all worked out fine. We packed, he spent the morning playing with his brother and sister, and when my parents arrived to pick him up, he went with them happily. This was, I must say, a first for my little guy - no fuss or muss. I think that the lessons of the Torah are (almost) always remarkably relevant to me and my life. Each time I read these stories of the dangers of having a "favorite" child, I think about how carefully and consciously I try to show my love to each of my children. Sam might believe that he gets less turns that his sister or brother, but to me, how many turns he gets is irrelevant to how much love I show him. I hope, as he grows older, that he will understand this. Each of my children is so different from the others - each one of them exists as a separate person with unique desires and interests. It's hard to balance this with the idea of "equality" - will they all get and do and have the same things? Probably not. They're different people, situations will change, needs will evolve. What might work for one at age 15 might not work for the next one. I have to keep my eye firmly on my prize - creating healthy, balanced, happy children who feel loved all the time for who they are. No small task, is it? It's far more than making sure everyone gets the same-sized piece of cake. It's far more than keeping track of who gets into the car first, or who chooses the next television program, or who holds which hand in the parking lot. It's making sure to kiss each child and have a moment to tell them I love them. It's making sure that I celebrate their small and big accomplishments and notice when they're good and kind to each other and to the world. It's noticing when they're feeling down and giving them some special snuggle time. And it's soothing hurt feelings when they don't quite feel fairly treated - and giving them space to air those grievances without laughing (too hard) at their seriousness. I don't think that Rebecca and Isaac were terrible parents. I think they made some terrible choices in parenting their children. And I think their lesson is loud and powerful for those of us who have to share our arms and our time and our laps with little human beings who want only to be loved. Sam and his Zeyde building a birdhouse together. One goes to ChambanaLaura and one to RavYoga! my dear friend, Cantor Neff - hey, Sally! Ladies, please email me your mailing addresses - phyl613 at gmail.com - thanks! Thanks to some amazing people, I got a pregnancy massage that was awesome. Wow. I don't even know how to say thank you - I was so overwhelmed with these gifts! Dairy Queen still doesn't deliver but my husband has taken pains to ensure that there's ice cream in the freezer at all times. (He doesn't mind sharing with me, either...so we've had ice cream parties almost every night. Don't tell the kids!) Thanks to a great friend who delivered it straight to me, I even have whipped cream! Thanks to everyone who offered maternity clothes but I think I'll just stick out the last bit with what I have. I did spill coffee on one shirt and I can't get it out...oh well. And I bought some new PJ bottoms which will last past the pregnancy, so that made me happy. I also bought a new pair of shoes for not too much money (and resisted the ones I wanted to buy so I can wait til afterwards) and so I'm feeling a little happier about that too. Literally, the same day I wrote the post, in which I asked for someone to walk around with me and remind me of the day of the week, I went to a place that had "soup of the day" listed and I asked her what day it was...and of course, she knew. So even that came true!!!! And I'm daily trying to remind myself what a blessing pregnancy is. I'm looking forward to meeting our little Yoda but I'm also savoring every moment....or trying to! So when I was given a chance to review his new CD, of course I said yes! The CD jacket bills itself as "14 original melodies" for the new siddur. This means that (I think) some of them are new versions of some of Craig's familiar standbys. I really like the new additions to Adonai S'fatai - an English verse that helps to illuminate the meaning and purpose of this line of prayer. (I'm not sure I'll be able to use the new part effectively in a service, but it's nice for learning and singing along in the car.) I also liked Rise Up and Acceptable ...and my husband and I were groovin' along to Out of Zion , which had a great beat! Craig's earlier Romemu has become pretty standard synagogue fare, but I really liked the new version on this CD ! I didn't love every track, but it had enough gems to keep me listening all the way through. Plus, I do think that some of Craig's music is perfect for tefillah (services) when adapted - sometimes I'll take out the English parts and just do the Hebrew, or just the chorus. But for listening, most of it was really nice. Overall, I would recommend this CD as a great addition to any Jewish listening library! I'm giving it away...would you like to have this CD for your very own? Leave me a comment, I'll choose one lucky reader by random drawing to win it. I'll post the winner on Friday...so you have until then to leave me a comment and tell your friends! Slightly blurry shot of me at almost 33 weeks. 1. A nice person to walk around with me (job qualification: ability to bend and lift) all the time and pick up things that are dropped or need picking up from the ground. Children will not suffice for this task because they, themselves, often are in need of picking up. 2. A nice person (probably different from the first one, job qualification: good memory) to walk around with me all the time and remember things for me. My name, my husband's name, my children's names, what day it is. Simple stuff, really. 3. Maternity clothes that I'm dying to wear. 4. For no one to notice that I've worn the same pair of shoes for about three weeks straight. Not really because my feet are swollen but because they're the best slip-on shoes I have. Tying shoes would require #1. 5. A nice person to walk around with me (in this case, nice is probably the optimal job qualification) to answer the questions. Yes, it's my 4th. Yes, I'm due in December. No, I don't think I'll "go early." No, we don't know if it's a boy or girl. Yes, we've chosen names. No, we're not going to tell you. (Except for my husband's favorite, I have to share that one. Oren Moshe Gershon. So that child would have the initials OMG.) Any questions I've missed? Please refer all questions to the nice person who is walking around with me. 6. A daily afternoon nap. 7. Stock in the company that makes Tums. It will be good for this child's college fund, I think. 8. For Dairy Queen to have a delivery service. At 11pm. 9. A massage. Hey, wait, that one might be possible. I'll get back to ya. 10. Someone to arrange said massage. 11. To find a way to stop being tired and busy long enough to savor every last moment of the end of this pregnancy....because I really want to. 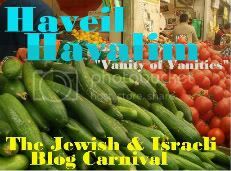 This week's Haveil Havalim is here. A few days after I wrote this post, I got a notice that Robie Harris's new book, The Day Leo Said I Hate You , was available for review. It was as though it was meant to be. So, of course I said yes! Not that it always does. In the case of Leo, he gets tired of all the "no" that his mom is throwing around. "No rolling tomatoes against the wall! No putting string beans in the fishbowl!" (Makes the mama reading feel really good - cuz what parent would cheer those things on!?) Then Leo comes out with the big guns. "I hate you!" and his mom is horrified. And Leo is properly horrified as well, which is nice. This is the hardest part of the book - just because I am horrified by something my kids say doesn't mean that they are too. But it's nice to read the book and talk about how Leo feels - obviously that's the point of the book - and it seems to be having an effect. My kids really love this book, we've read it many times. This book is wonderful for those kids in your life who really want to move to Australia. The illustrations are colorful and the words themselves jump off the page (great for people learning to read the word "no," for example). It does seem to be review week here at the Ima's place, but unlike the other two things I've reviewed so far, I'm not giving this one away...it's a new family favorite. But please, go and pick up a copy. You won't regret it. It's coming out in paperback in November - if you must wait until then. Full disclosure: I received a free copy of this book from the publisher for review and I am keeping it. I am giving away: For The Love of Being Jewish (signed copy!) and 2 Shalom Sesame DVDs - so check those out too! What can you say when your boss writes a book? In this case? That it's great. Yes, my boss, Rabbi Steven Stark Lowenstein, wrote a newly published book! It's called "For the Love of Being Jewish " and it's a coffee-table picture book. Using RHYMES AND COLORFUL ILLUSTRATIONS, "For the Love of Being Jewish" explores the key concepts of Judaism in a fun and humorous way. Definitions of key Jewish words, inspiring quotes, and clever caricatures of famous Jewish people make one of the world’s oldest religions accessible and understandable to all. Packed with colorful illustration and whimsical verses, this lighthearted, factual, and entertaining exploration of Judaism is the perfect book for encouraging people of different faiths to learn from each other. Through the lens of history, culture, ethics, and values, important Jewish themes are uncovered in a way that makes us chuckle— and think. 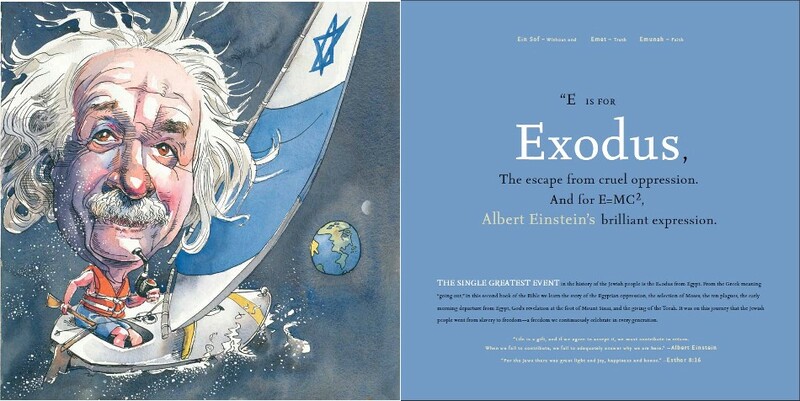 While it’s not possible to pack 5,770 years of history into 48 pages, For the Love of Being Jewish touches upon some of the key concepts of one of the world’s oldest religions and introduces us to Jewish people who have helped make the world a better place, from Moses to Albert Einstein to Bob Dylan. And it really is a fun and wonderful book. For me, it's particularly fun, because I can see Steven's favorite quotes and ideas sprinkled throughout - his voice is clearly there, even though he doesn't usually speak in rhyming verse. It's an alphabet of Jewish life, done in a way that you might not expect. One of my favorite rhymes? who luckily didn't have another brother. I really recommend this book - a great gift, a fun addition to every Jewish shelf. I have one to give away! Funny enough, even though we have many copies here at the synagogue (go figure), the publisher actually sent me a review copy (Dear Rabbi....) so I decided to give that one away to ONE lucky reader. I'll even have it signed just for you (since I do have an in with the author!) - how cool is that? I'll do a random drawing next week to pick the winners. You have until next Thursday night, October 21st. The two episodes that we received were the first one, "Welcome to Israel" and the Chanukah program "The Missing Menorah." Both feature Grover and Anneliese van der Pol, an actress with whom I wasn't familiar. I plunked my children down in front of the TV, and they were very excited for a daytime television treat. It started well. We got through the opening credits/singing, which ends with children shouting "Shalom Sesame!" and Yael promptly responded "Shalom Sesame!" We were off to a good start, I thought. Sidenote, with full disclosure: My children don't watch Sesame Street. I grew up on it, I love it, but for whatever reason, it doesn't hold my children in its thrall. Disappointing to me, but how can I force them to watch things they don't care to see? So they're not knowledgeable about Grover and his ways. Do your kids watch Sesame Street? Things declined from there. Anneliese is on a plane going to Israel and she just wants felafel. My children know what felafel is. Do most American children? There's no explanation of it and many of the terms are completely undefined. I think I'd feel confused if I were someone who did not know much about Israel. There were cute cartoon sketches reminiscent of all the Sesame Street episodes I've seen, and a number sketch with the Count at which the "number of the day" was chosen, with counting in both English and Hebrew - but not much reinforcement of the Hebrew words for the numbers. There was also a letter cartoon section, with some words that started with "yud." Overall, Sam gave it a thumbs down and Yael gave it a thumbs up. So when we went to watch the Chanukah video (a few days later), Sam preferred to play his handheld video game while Yael watched. This one was about the holiday of Chanukah, obviously, but only slightly explained what sufganiyot are. The "lost menorah" took about 45 seconds to find, during which the characters all sang a song that wasn't very memorable. The brachot weren't said, and the story of Chanukah was told in a pretty simple and often confusing way. The number of the day was 8, but I'm only now realizing why, since a direct connection wasn't made.Overall, even Yael was a little disappointed with this one. So....on the upsides: the video quality is great. The colors are bright, the cartoons don't look dated, it's fun to watch and to have Hebrew on the TV in our house. But for learning something? I don't think that my kids got a lot out of these videos. The PR materials did call the series "edu-taining" and I think it's a little light on both education AND entertainment. Maybe this is why the regular Sesame Street show is 1 hour long - to enable them to have many different segments all in the same show. Perhaps they tried to do a little too much. What worked for me in the original series was that even though they were technically driven toward small children, even the older kids (like me) could see them at Hebrew School or camp and enjoy them. I think these are too focused on the 3-6 year old crowd to be pleasing to older children. Some of the gags were definitely funnier for the parents than the kids. And Grover does do his waiter bit, which was always a favorite of mine. It went totally over my kids' heads. Sigh. I really wanted to LOVE these videos but I didn't. So I'll leave it to you...I'm giving away both DVDs, just leave me a comment here and you're entered to win! I'll do a random drawing next week to pick the winners. You have until next Thursday night, October 21st. You can let me know what you think! David Levy of JewSchool presents Dear Queer Kids, Please Stop Killing Yourselves. The Holy One Created Tyler posted at Or Am I? Still in Shock posted at Walking Humbly, Seeking Justice. And along the same line, this post from JewSchool reminds us that we must be a light unto the nations and Hold them to a Higher Standard. The always-funny Benji Lovitt presents WWZ Vlog #2: Israeli Taxi Driver. Eric @ IsraelSituation.com examined Stereotypes Come Out in HaMisrad (The Office). Shiloh Musings posted: Mubarak, Stop The Threats! and Dangers of The Jewish and Israeli Lala Left, also Proper Use of Strength, Pirkei Avot, Ethics of the Fathers. Yoel Meltzer posted A Trip to Outpost Land. Esser Agaroth says that Israel Must Say "Yes" To Torah, Sooner Or Later. Good News from Israel shared Photos of Ma'ale Adumim's Dog Day. Daniel Ben-Shmuel presents Rachavam Zeevi's Misguided Message (audio). Occidental Israeli wrote Unlikely Mythbuster and Entitled. The Real Jerusalem Streets always has beautiful photos and a taste of what’s going on in the Holy City. Wikibias offers us More on the Deletion of Israel Articles. The 59th Kosher Cooking Carnival is up for Rosh Chodesh Cheshvan! Elianah-Sharon of Irresistably Me wants to know Did I ever tell you the one about my dad and the clams? The HomeShuler and the Edible Torah got together for this guest post on Tuxedo Potatoes (and other things). A Chassidishe farbrengen posted Loving rebuke and Seraphim: Passionate love for Hashem, also The Moshiach paradox: Preparing and praying. The parshablog wrote Rav Yonasan Eibeshutz's Rocket Ship and also An analysis of Rav Yonasan Eibeshitz's Space Elevator. A Simple Jew talks about Why am I a "Weekday Vegetarian"? The Rebbetzin's Husband wrote Rav Saadia Gaon tackles Chivi haBalchi and Of Bobby Cox and Synagogue Rabbis. Yechezkel gives a Chareidi perspective on What It Means to Convert. Adventures in Mama-Land is hosting Jewish Homeschooling Blog Carnival #1: Cheshvan 1, 5771 - a new carnival for Jewish Homeschoolers. Check it out! DovBear wrote Noach is the most difficult parsha: Questions and then Noach is the most difficult parsha: Answers. Just call me Chaviva discovered A New (or Old) Convert! Will Social Networks Change the World or do we still have to do the heavy lifting? posted by Ira Wise. Frume Sarah muses on A Purse is just a?...a strange Facebook phenomenon. Dov ben Avraham, seeking information, sent in this post from Just call me Chaviva: A Friendly Request: Gerim! The Minnesota Mamaleh presents About Threes. JewWishes reviewed War On the Margins (among other books and stuff this week). An interesting post from the JDC about The Race for the Cure in Sarajevo. Oh, and did everyone see these interesting things: Jewish New Media Innovation Fund is offering grants and such. And for those in the Reform movement, the URJ is doing a Techie award! That's all for now, folks! Hope I didn't miss anyone. Feel free to share your own favorite posts from this week in the comments. The new moon of the month of Cheshvan falls over this Shabbat. Cheshvan is the month that follows Tishri, which is a pretty big deal in the Jewish calendar - many many holidays. In Cheshvan, there are no (Jewish) holidays, and therefore the month is known as "Mar" or "bitter." May this month of Cheshvan bring you balance and harmony, an opportunity to find blessing in the ordinary and everyday, a chance to breathe and regroup...may you celebrate life!